Five major food crops - maize, rice, sorghum, soybeans and wheat - grown in open-air trials under carbon-dioxide levels projected for the future are producing significantly less than those raised in earlier greenhouse and other enclosed test conditions. As a result, scientists are warning that global food supplies could be at risk without changes in production strategies. The new findings are based on on-going open-air research at the University of Illinois at Urbana-Champaign and results gleaned from five other temperate-climate locations around the world. According to the analysis, published in the June 30th issue of the journal Science, crop yields are running at about 50% below conclusions drawn previously from enclosed test conditions. This casts serious doubt on projections that rising CO2 will fully offset losses due to climate change, as was predicted by previous smaller-scale experiments. Results from the open-field experiments, using Free-Air Concentration Enrichment (FACE) technology “indicate a much smaller CO2 fertilization effect on yield than currently assumed for C3 crops, such as rice, wheat and soybeans, and possibly little or no stimulation for C4 crops that include maize and sorghum,”according to Stephen P. Long, U. of I. plant biologist and crop scientist. FACE technology, such as the SoyFACE project at Illinois, allows researchers to grow crops in open-air fields, with elevated levels of carbon dioxide simulating the composition of the atmosphere projected for the year 2050 [see picture above]. SoyFACE has added a unique element by introducing surface-level ozone, which also is rising. Ozone is toxic to plants. SoyFACE is the first facility in the world to test both the effects of future ozone and CO2 levels on crops in the open air. Older, closed-condition studies occurred in greenhouses, controlled environmental chambers and transparent field chambers, in which carbon dioxide or ozone were easily retained and controlled. By 2050 carbon dioxide levels may be about 1.5 times greater than the current 380 parts per million, while daytime ozone levels during the growing season could peak on average at 80 parts per billion - 1.33 times higher than current concentrations of 60 parts per billion. 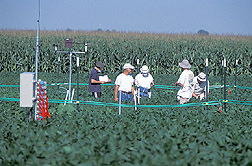 Older studies, as reviewed by the Intergovernmental Panel on Climate Change, suggest that increased soil temperature and decreased soil moisture, which would reduce crop yields, likely will be offset in C3 crops by the fertilization effect of rising CO2, primarily because CO2 increases photosynthesis and decreases crop water use. Although more than 340 independent chamber studies have been analyzed to project yields under rising CO2 levels, most plants grown in enclosures can differ greatly from those grown in farm fields, Long said. FACE has been the only technology that has tested effects in real-world situations, and, to date, for each crop tested yields have been “well below (about half) the value predicted from chambers,” the authors reported. The results encompassed grain yield, total biomass and effects on photosynthesis. The FACE data came from experimental wheat and sorghum fields at Maricopa, Ariz.; grasslands at Eschikon, Switzerland; managed pasture at Bulls, New Zealand; rice at Shizukuishi, Japan; and soybean and corn crops at Illinois. In three key production measures, involving four crops, the authors wrote, just one of 12 factors scrutinized is not lower than chamber equivalents, Long said. “The FACE experiments clearly show that much lower CO2 fertilization factors should be used in model projections of future yields,” the researchers said. They also called for research to examine simultaneous changes in CO2, ozone (O3), temperature and soil moisture. Long and four colleagues were co-authors: Elizabeth A. Ainsworth, professor of plant biology; Andrew D.B. Leakey, research fellow in the Institute of Genomic Biology at Illinois; Donald R. Ort, professor of plant biology and crops sciences; and Josef Nösberger, professor at the Swiss Federal Institute of Science and Technology in Zurich. Long, Ainsworth and Ort also are affiliated with the Institute for Genomic Biology, and Ainsworth and Ort also are scientists in the USDA-ARS Photosynthesis Research Unit on the Illinois campus. The Illinois Council for Food and Agricultural Research, Archer Daniels Midland Co., the USDA and U. of I. Experiment Station funded the research. Well, this research seems to weaken the case of those that argue we shoudn't worry too much about global climate change. The older studies that had predicted increased crop yields under high-CO2 scenarios are often pointed to by those who think a strong and proactive response to climate change is unneccessary. It's a pretty tall claim to say that yields will be 50% less than expected based on previous work. If you look at the FACE trials in the literature, there's huge variation from one site to another, and from one set of conditions (irrigation, N application, micro-nutrients, sunshine, temperature) to another. Maricopa is spefically mentioned in the paper cited above, namely FACE trials from 92/93 on wheat using doubled CO2. The yield increase with doubled CO2 there for example for well irrigated conditions and doubled CO2 was 10% in 92 and 17% with half the water in 93. I haven't got access to the Science paper, it's not free and I won't pay for it. But my personal expectation is that the press release is grossly distortionary. It'll be something like added ozone together with higher CO2 lowers the yield increase from 10% to 5%, ie halves it. I find it exceedingly unlikely that this single paper would overthrow all previous work on the issue. Estimating the overall effect of climate change depends to the best of my knowledge mostly on assumptions about what will be grown where with what inputs (irrigation, fertiliser) and regional precipitation and temperature trends from the climate models. Personally, I think a lot of irrigation will be used in places like Southern Siberia, Canada and Northern China and that CO2 fertilisation and higher temperatures will make these places attractive enough to shift a lot of wheat production there, with the tropics and subtropics concentrating instead on crops like the oil palm that are crucially dependent on hot weather. Actually it seems that my university does have a paper subscription, it'll be another 3 weeks before the issue in question's here though (apparently the electronic subscription is too expensive). And I came across the free supplemental material, which shows the dangers of commenting on a press release rather than the actual paper. From the supplemental material I gather it's a literature review, or at least a literature review is a big part of it. Certainly the press release has piqued my interest sufficiently that I'll read what they've got to say, once I can lay may hands on the paper without having to pay $10 for the privilege. I'm sure that this study alone won't overthrow all of the previous research, and I don't think that the authors, or the press release, claim that. However, this study certainly adds a cautionary note to the optimism often expressed by those citing the previous studies that increased CO2 will increase yields enough to overcome other climate change-induced (negative) effects on yield - like cropland shifting to higher latitudes or increased drought/desertification of farmland. The methodology of this study - i.e. using open-air FACE trials rather than contained greenhouse or 'bubble' or other types of small-scale controlled environments for studies - seem to be a better and more accurate way to study the effects of climate change on food and other crops and this study, I belive, was intended to begin a series of new research to continue to refine our knowledge of what climate change may do to our food supplies. At least, that was what I got out of an interview with one of the paper's authors on NPR's Science Friday last friday (you can find the podcast here). Thanks for the link, it's definitely something I'll be following with interest. For me, CO2 fertilisation is a big issue, pretty much the decisive issue in so far as convincing me that small levels of climate change (2-3C) will likely be a net positive. I know. I posted this article with you in mind! Thanks for your continued input here, Heiko.